Join us for a very special Free Third Thursday on March 16 from 5–8 pm for Night of 1,000 Faces. Help us connect 1,000 people through art! Hear from The Outwin 2016 first prize winner Amy Sherald and get a free exhibition poster signed by her. Limited seating and supplies. See below for details. Draw your own quick portrait on our Night of 1,000 Faces banner in the TAM Studio. Share on social media with hashtag #inspiredbyTAM to be featured on our Instagram. Celebrate TAM Local: Washington State School for the Blind at a reception for this community art show in the Cheney Classroom. Free admission to all exhibitions and your last chance to see Coast to Cascades: C.C. McKim’s Impressionist Vision before it closes on March 26. Hear from The Outwin 2016 first prize winner Amy Sherald. Her unique life-size portraits have received national acclaim and her entry won the top spot from among more than 2,500 entries in The Outwin 2016: American Portraiture Today. Take advantage of this rare opportunity to hear from her and see her work in TAM’s galleries as part of this remarkable exhibition from the Smithsonian’s National Portrait Gallery. This program is free and open to the public. Visitors will be admitted on a first come, first served basis. If you are interested in attending, please visit the registration table outside of Murray Family Event Space on Third Thursday, March 16 between 5 and 6 pm. We have a limited capacity of 120 attendees. Thanks and we look forward to seeing you at the museum! Free museum admission begins at 5 pm. However, paid admission is not required to visit the TAM Cafe. Come early and relax in the TAM Cafe for happy hour discounts on beer, wine, and snacks. Tacoma Art Museum joins other local museums in staying open late (5–8 pm) and free to the public on the third Thursday of every month. Enjoy all of our exhibitions, as well as additional programming and entertainment. 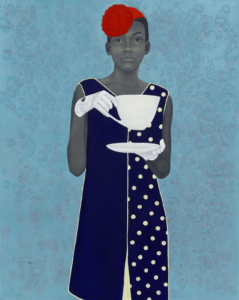 Amy Sherald, Miss Everything (Unsuppressed Deliverance), 2013. Oil on canvas, 54 × 43⅛ inches. Frances and Burton Reifler. © Amy Sherald.